Eating is a huge part of my existence and I love to share that by entertaining guests in the dining room. Maybe my love of food is just an Asian thing, but I think it’s more universal than that. 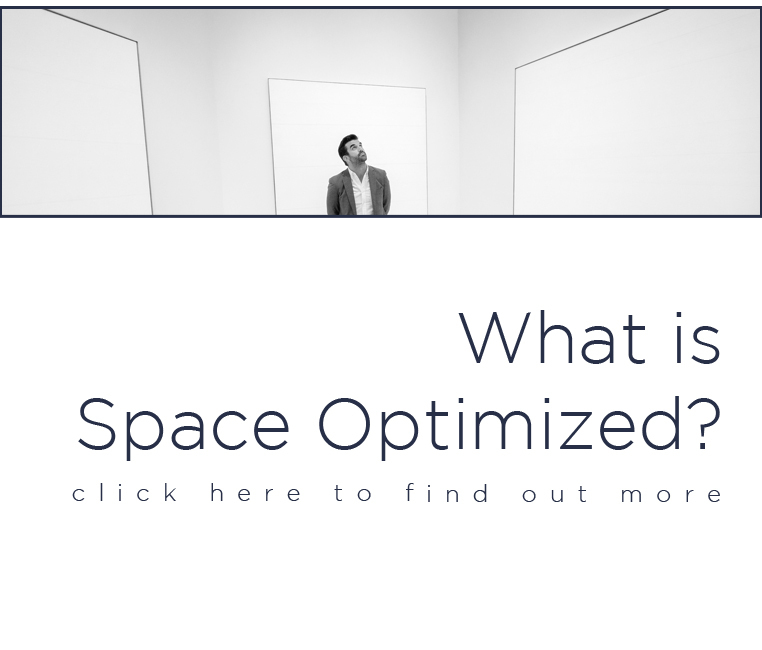 Of course, not all homeowners have the space or the luxury to have a huge dining room. 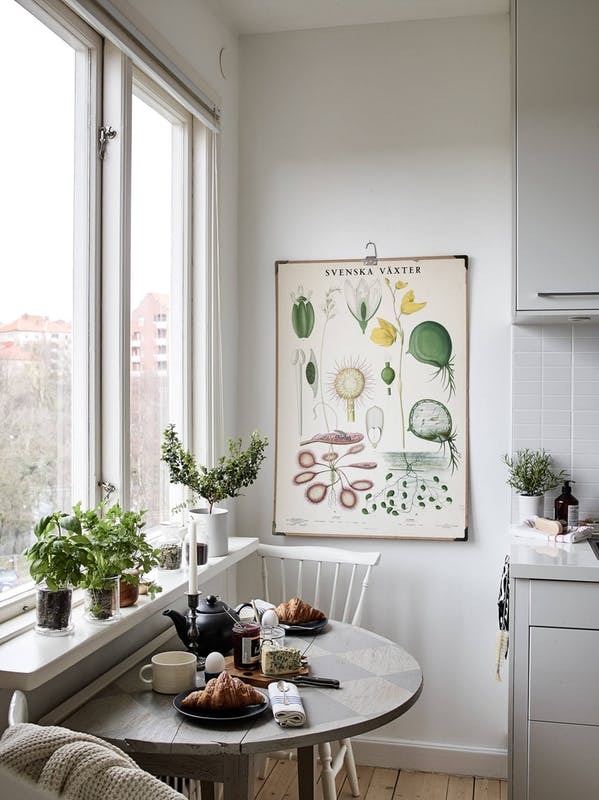 City dwellers, for instance, often make do with teeny tiny slices of space for a dining room. There are cases wherein a tiny apartment has zero space for eating. A square or rectangular table is a common sight in the dining area but if you are working with limited space, opt for a round table. A round table could seat more people and is able to fit tight corners. The shape is also compact, making it perfect for a tiny apartment with limited space for a dining room. Bonus points for round tables with space underneath to stow chairs away. When not in use, the chairs aren’t using up the floor space. Bistro tables, wall mount skinny tables, bar table, and expandable tables are great subs for a full-sized dining table too. 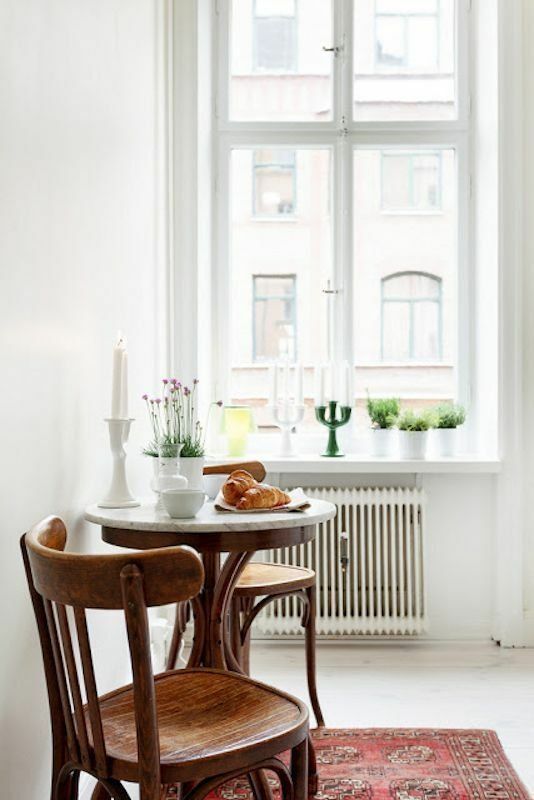 Another great idea for a tiny dining room is to use foldable chairs and tables. These pieces of furniture are collapsible so they can be stowed away when not in use. Foldable chairs and tables are often compact and easy to assemble. These pieces of furniture are designed specifically for tight spaces. And within minutes, you can turn a blank space into a dining room with just a flick of the wrist. They are perfect for tiny homes with dual-purpose spaces or small apartments with no formal place for eating. 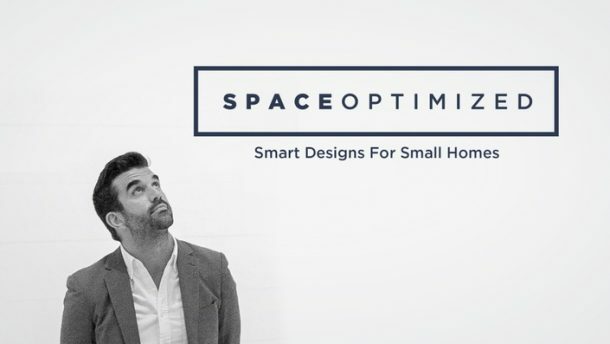 If you are dealing with small spaces, you can break several interior design rules. One of these rules is setting the furniture against the wall. Usually, you want to set pieces of furniture closer together to create an intimate, conversation-friendly space. 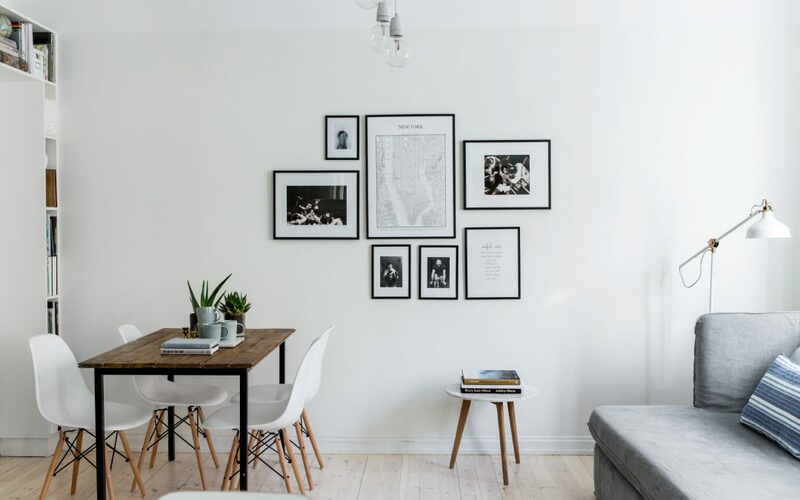 But if the dining area is relegated to the farthest, tightest corner of the home, move the pieces of furniture right up against the wall or a window sill to maximize the legroom. If you’re working with tight spaces, don’t be afraid to break perceived rules to make every square inch of space work harder! It is important to keep the dining room looking warm and inviting. It makes eating and conversing more fun and relaxed that way. But if you don’t have enough room to spare for fancy accessories or decors, keep the dining room design simple and minimal. Adding simple decors makes the dining room look and feel balanced. 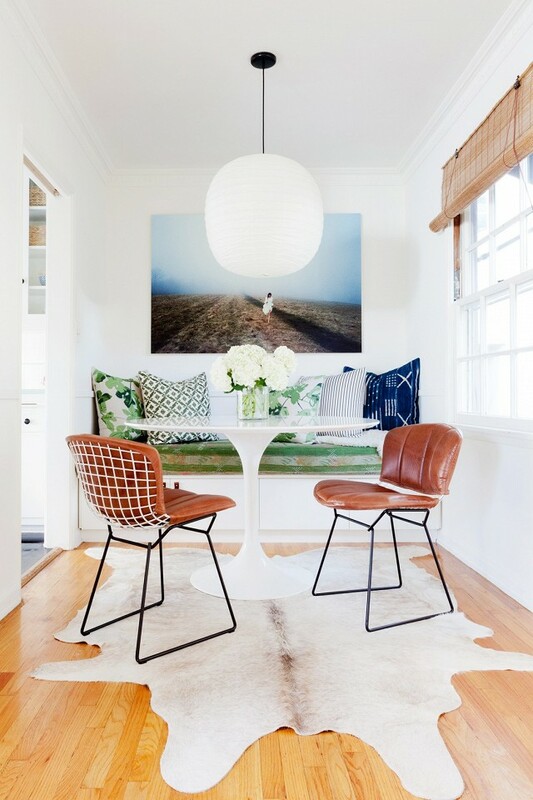 Since the minimal decors are not overpowering the space, the dining room looks bigger than it really is. 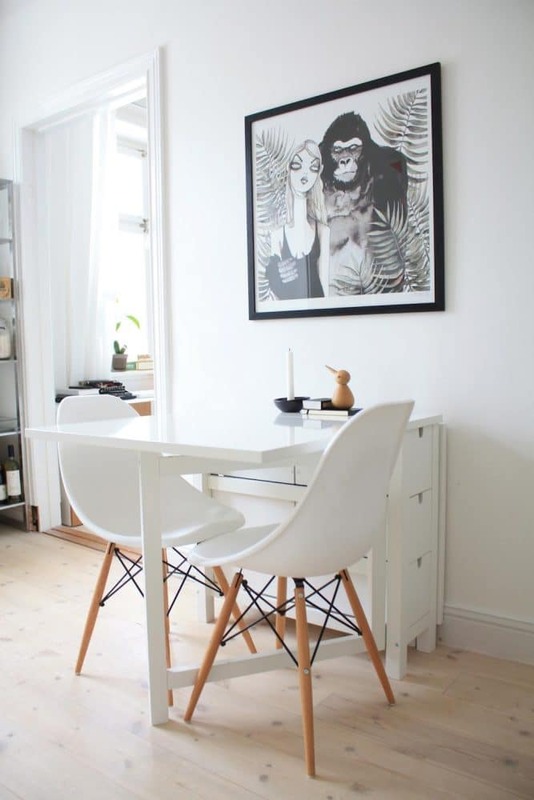 The same thing goes for the pieces of furniture in the dining area, keep them compact, sleek, and minimalist to make the space work extra hard! For a dining room set in an awkward spot, you have to define the space. Accentuate the dining room by hanging artworks, mirrors, or pendant lamps to draw the eyes to the space. You can also use rugs and carpets to soften the look of the dining room, define the space, and create a cohesive apartment design! 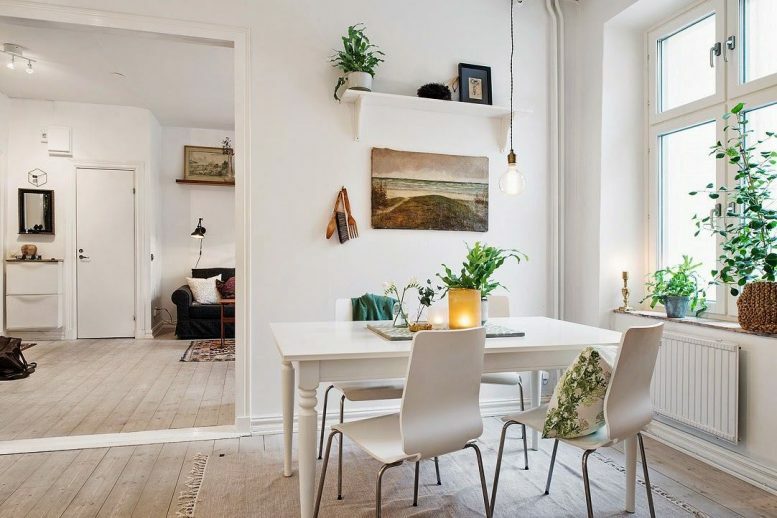 For a tiny apartment with almost zero room to spare for a dining room, you need to choose pieces of furniture that blend seamlessly with the surroundings. Opting for pieces of furniture in shades that match the walls or floors make a room appear larger. This trick also gives the dining room a seamless look, making the space appear less cluttered. 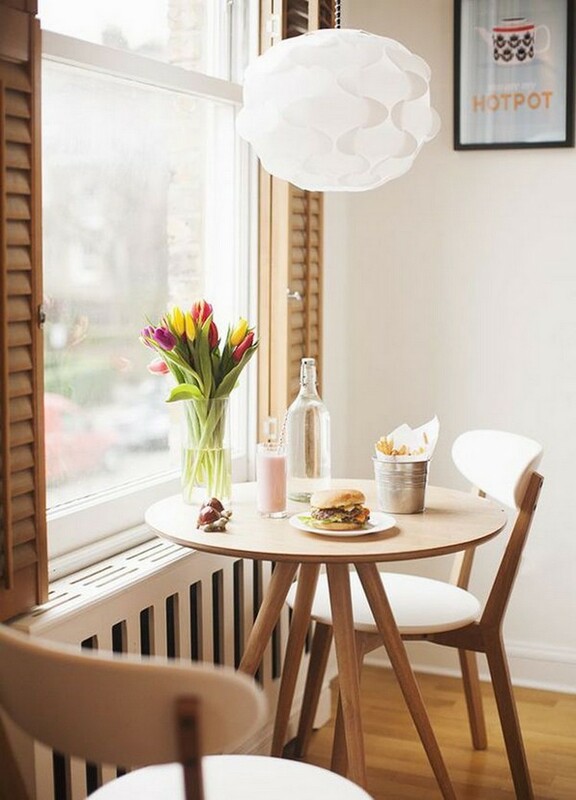 If your tiny apartment only has a sliver of space to spare for a dining room, focus on a design that embraces the intimate, cozy space. You can use all the design tricks in the book to make the space appear larger but in the end, you just have to make do with what you have! Perfect the intimate, cozy look by layering the textiles, adding low light fixtures, and focusing on soft details to make even the tiniest dining room look warm and inviting.